So it seems making Starbucks copycat recipes is my new hobby. I’m not sure why I started but when I read last week that Starbucks was releasing their first new holiday drink flavor in years-the Chestnut Praline Latte-I just knew I needed to create my own version. Because the drink hasn’t been released yet in my area I can’t say how close my Praline Latte Recipe will be to their Chestnut Praline Latte but regardless-this thing is tasty!! I started by melting 4 tablespoons of UNSALTED (that’s important!) butter in a small saucepan. This is one recipe that you can’t use margarine in-you’ll get an icky yellow separation if you do-don’t ask me how I know! When the butter was melted I added a half cup of light brown sugar and stirred until boiling. Then add one cup of milk and heat until simmering, stirring occasionally. 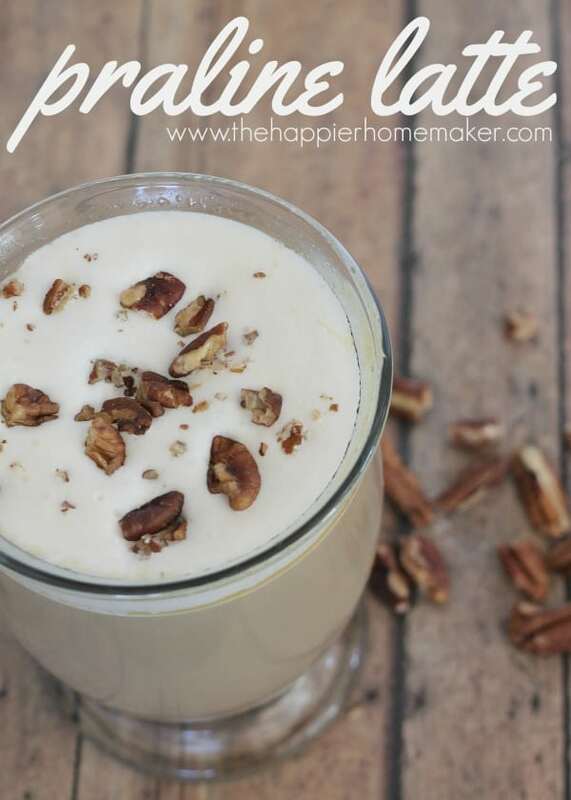 This latte has all the sweet flavor of pralines and can be whipped up in less than ten minutes. Melt butter in a small saucepan over medium high heat. Add brown sugar and heat to a boil, stirring constantly. Add milk and bring to simmer, stirring often. 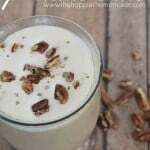 Combine half and half with coffee and top with whipped cream and pecans if desired. For more Starbucks inspired recipes try my Skinny Pumpkin Spice Latte or Starbucks Copycat Lemon Loaf! Oooh, I’m intrigued by this one! Definitely going to have to try it out! I hope you love it Emily, it is SOOOOO good! I finally tried this recipe today! It was pretty delicious; perfect for those days that deserve a special treat! Thanks for sharing! 1. Do NOT leave your stove unattended even for a minute. It could start boiling and then it starts to separate into this icky looking coffee with chunky bits of milk. 2. Instead of waiting for the brown sugar and butter mixture to boil, just add the brown sugar, mix it as best you can, then pour in the milk. I ended up not having nearly enough butter to make it boil and I didn’t want to burn. At this point it’s best to use a whisk (or fork if you don’t have one) and mix the brownsugar + butter mixture and the milk. 3. This does not need any half an half. It’s already super sweet and the cream you get from the whip makes it perfect. If you add any creamer it’ll drive it over the top. 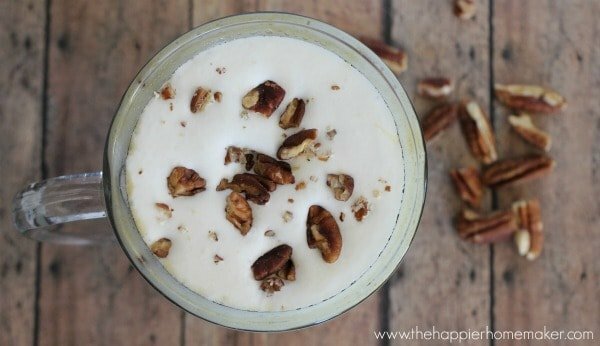 The next time I make this I think I’m going to add some chopped pecans and cook them with the drink itself. It might make it a little nuttier. I give this recipe two thumbs up! It’ll definitely warm me up during the 8 AMs I have for the rest of the semester and then some. I’m so glad you liked it Sarah, thanks for the suggestions!! That’s awesome Lisa, you’ll have to let me know how it compares-I haven’t had one yet!